From I-85 North, take Exit #99, Jimmy Carter Blvd., and turn left over bridge. 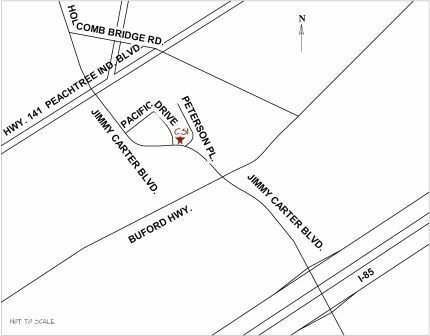 Proceed for about 2.1 miles, crossing Buford Highway, turn right onto the 3rd street on thr right, Peterson Place, and then take the first left into the parking lot. Our building faces Jimmy Carter Blvd. From GA 400, take the Holcomb Bridge Road exit towards Norcross. Continue straight onto Jimmy Carter Blvd. when Holcomb Bridge turns left. Pass under Peachtree Industrial Blvd., cross railroad tracks and turn left on Peterson Place. Take the first left into the parking lot. Our building faces Jimmy Carter Blvd.